Select Database -> Create Schema For Database in HTML (Ctrl+Shift+Alt+S). This is useful for documentation of database as you may print the schema nicely with appropriate page breaks, formatting etc. 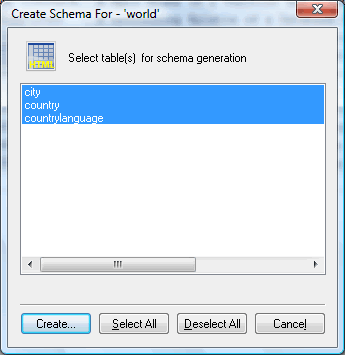 Select the Tables for which Schema to be created. You may use Select All/Unselect All buttons to create the Tables quickly. Click Create button. You get the file dialogue box to specify the filename to store the generated schema.